These days I was receiving almost 40+ spam comments with same IP address. I was searching for a solution to fix this problem. But most of those guide which I have found are not that efficient. Because, some guides suggest blocking spammers IP address to stop accessing your wordpress blog itself. I don’t think this is an efficient method. Why because, these spammers don’t use their original IP address, they use proxies to do these spam work. If you block some spammer IP address today, tomorrow the same IP address maybe used by genuine user to visit your blog. Because you have blocked that IP address to prevent spam, now you’re also blocking genuine users as well. So this is really not an efficient method. We are loosing our visitors by our foolish steps. Instead of that, here is an another method. How about blocking only comments function? Yes, this works. I was receiving 40+ spam comments for almost one week daily with the same IP address. I followed this method, and from the next day itself I stopped receiving all those spam comments. To block spammers leaving comments, open you .htaccess file and paste the below code on it and save that file. 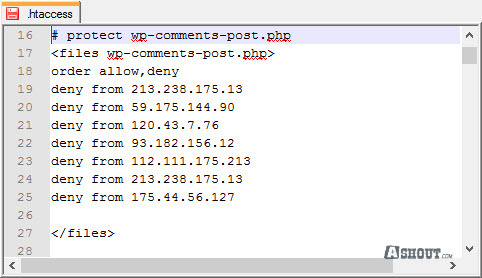 Don’t forget to replace the above IP address with spammers IP address who are leaving spam comments on your blog. What this code will do is, it blocks users from posting comments on your wordpress blog with the IP address that you have added. By this way users can access content, but he cannot able to post a comment. This method really works if you are receiving spam comments only from the same IP address. I usually remove those IP address after 1 or 2 months. Because by that time spammer might removed your blog form his list. By this way we don’t block any genuine commenters as well. I am looking for this article. Because I want to secure my site from spammers. Thanks you very much. You have a point there regarding blocking IPs but if you use a firewall plugin, offender’s IP addresses are blocked for a period of time. This is much more convenient then manually block/unblock IPs via .ht access.